Offer is valid for once per user. Maximum coupon discount is Rs 100. Order Now! Coupon/Offer Details: UberEATS in India helps you locate all your favorite restaurants and food delivery partners at one place and makes your online food ordering experience more convenient. Choose from 100's of restaurants and also now you can get up to Rs 250 Off on your first orders. Ubereats offers are valid for a limited time. Your City's Best Food In One Place. Download Now & Get Faster Delivery. Hurry Up! 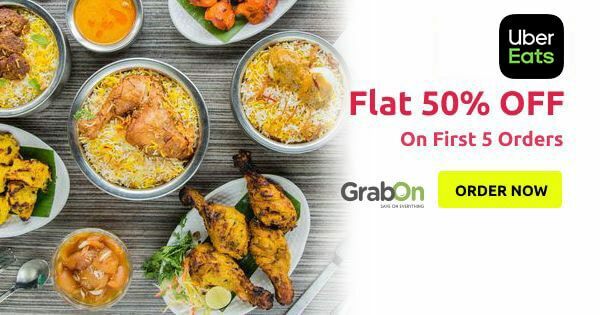 Ubereats is offering flat 50% Off on wraps, biryanis and more from faasos and cookie man stores listed in their web or app. Code is not required at checkout. UberEATS is offering instant Rs 100 discount on meals, curries, desserts, biryani, snack varieties from wide range of restaurants. Minimum cart value should be Rs 200. Maximum discount is Rs 100 per transaction. UberEATS India, food delivery network powered by Uber presents the best local restaurants to get you the food you want, delivered faster now in India. McDonalds is live now in Ubereats, Get 50% Off on every order of value above Rs 100 and also avail free delivery to your doorstep. Offer is valid for 5 orders per user. Minimum transaction value of Rs 100 is required. Maximum cashback is Rs.50 per Uber Eats order. Your mobile number must be verified in order to receive cashback. Coupon/Offer Details: Naturals Ice Cream is having lip-smacking delicious collections of desserts, ice cream, and yogurt. Choose from these Berry Festival, Buy One Get Another Free ( Cups ), Flavours, December Flavors, New Flavours, Most Popular, Fruit Ice Cream (Round The Year Ice Cream), Chocolate Ice Cream, Family Pack (500 gms) Tub, Extras, Ice Cream Shakes and get 1 free. Additional promo codes are not required. Order Now! Maximum savings - Rs 100 per transaction. Catalog consists of Indian, Chinese and all other region cuisines from pioneer and star rating restaurants. Deal code is not required. The ultimate comfort food, now at an irresistible price. Order Now! Coupon/Offer Details: A cup of chai makes everything better! Throw in a banana cake and it makes everything perfect. Enjoy flat 51% Off on the entire Chai Point menu only on Uber Eats! Binge on your favourite Chai, Samosas, Poha, Maggie or Puffs at less than half the price. No promo code required, prices on the menu have been slashed by half to keep it simple, just the way you like it. Coupon/Offer Details: Now order milkshakes through Ubereats for just Rs 99 today from your favorite restaurants. This offer is valid for selected city users. This deal is applicable for limited period. With UberEats now in India, get the best price on your food delivery. Use the Ubereats App and by applying the code to get benefited. Just Choose your location and order your Favourite food from UberEATS. Get it as early as you ordered only at UberEATS. At a delivery fee of just Re 1, you can now order from your favourite neighbourhood restaurants. Just Hurry up and order Now Only at UberEATS! Promotional code is not required. Order Now! Invite your family and friends to use UberEATS mobile app. They will get Rs.50 OFF on their first order. Please check out the coupon code at payment page. Grab buy 1 get 1 free or flat 50% off on scrumptious desserts/ice-cream flavours from creamstone, baskin robbins, natural ice-creams and shakes from keventers in ubereats website/app. Discount code is not required. This month, Ubereats bring you your favourite Strawberry Ice Cream from Naturals Ice Cream at an irresistible price of Rs 25 only. Online food delivery has made our lives very easy. You can order delicious, finger-licking food right from the comfort of your home by choosing from a wide range of dishes. All of this can be done on the screen of your smartphone and all it takes is a few taps! Global online food ordering and delivery platform Uber Eats makes it even easier for you. You can now choose from the best of local cuisines and order from the best restaurants in your area. What Is Uber Eats And How It Works? Uber Eats is an American online food ordering and delivery platform that was launched by Uber in 2014, as UberFRESH in California. The service providers later changed their name to UberEats in 2015 and quickly began spreading across the world. Uber Eats launched in India on May 2nd 2017. This latest food delivery app takes all the fuss out of online food ordering procedure. With a push of one button, you can order whatever you fancy for an early morning breakfast or a sudden craving too. They have partnered with some of the best-known restaurants and eateries in India. Uber Eats has covered most of the major Indian cities as discussed below. Look out for the amazing UberEATS promo code and coupons that are coming your way. After the rebranding of 2015, Uber Eats launched its own app separate from the Uber Rides app. The Uber Eats app is available on Google Play as well as Apple App Store for free. Uber Eats lets you choose from a wide variety of partner restaurants, for example: Uber Eats has partnered with more than 200 restaurants in Mumbai. So, rest assured you will never run out of options while ordering food from the uber eats app. The app is user-friendly and offers exclusive mobile offers, so download the app if you already haven’t. Uber Eats offers tasty and affordable food, but you can save even more on every order by using promo code for UberEATS listed here. How To Order Food Using Uber Eats App? What Are The Benefits of Ordering With UberEats? You can order food via UberEATS while traveling in an uber cab. They have integrated the two apps so that ordering a meal becomes even easier the go. Uber Eats has a shorter wait time with an average delivery time of 35 minutes. Flexible mode of payment by bank credit and debit cards, cash on delivery and via mobile wallets like Paytm. Great incentives like uber eats offers and promo codes. What Are Some Of The Best Uber Eats Offers? This offer is valid only for first-time users and can be used twice/user. Get flat 50% discount on your first 2 orders by using the code ‘PAYTM50’ while using the Paytm wallet. You can avail a maximum discount of Rs 150 on two orders. This is a limited time offer. Place your order on Uber Eats, pay with Paytm wallet and get your food delivered to you for just Rs 1. There is no minimum transaction amount required to avail this offer. This offer is valid on all orders. Order for a minimum of Rs 250 and pay using Paytm wallet to get upto Rs 100 OFF on the order. The offer is valid only on the first 2 orders. You can choose from a wide variety of restaurants and dishes from top restaurants in Mumbai, Delhi, Bangalore, Hyderabad and more. With Uber Eats you have the chance to earn free meals by referring your friend and asking them to sign up and order with Uber Eats. Once your friend signs in and places the order using the code, they will get their free meal worth Rs 100. Upon completion of their order, your next meal (worth Rs 100) will be free. Order delicious dishes from your favorite restaurants and get Rs 250 OFF on your orders. The offer is valid for all users and is a limited time offer. So, use it while it lasts. There is no minimum cart value required for using this offer. Teaming up with Bollywood celeb Alia Bhatt, Uber Eats has launched its first brand campaign celebrating Everyday Moments. Be it a cheat day, house party or as an excuse for not eating bland dinner, Uber Eats has delicious food for all of these moments. Right from the calorie conscious ‘cheat day’ moments to the indecisive ‘kuch bhi order karde’ moments of a house party all the way to the boring ‘tinda dinner’ moments! The on-demand food delivery network has listed close to 150 restaurants for online order in Guwahati while the number of restaurants offering online delivery in Thrissur stands at 50+. In Guwahati, ubereats offers flat 50% off on order value of Rs 100 and above. You can use the uber eats promo code and uber eats coupon code and save big everytime you order online. How To Use Uber Eats Promo Codes? Click on ‘Show Coupon Code’ and copy the code or click on ‘Get Deal’ to activate the deal. Stay updated with all the latest Uber Eats code by subscribing to this page. For Customer Service Helpline, call on 8971 222 222. You can also email them on eats@uber.com. To reach to Uber Eats for further queries, visit the ‘HELP’ section in Uber Eats App profile tab. You can also check out the Uber Help page: https://help.uber.com/eaters. Online food delivery has made our lives very easy. You can order delicious food from your smartphones and get it delivered to your doorsteps. Uber Eats is the newest in the long line of food order and delivery apps. Uber Eats has gained instant popularity because of the shorter wait times and amazing deals and offers like Uber Eats promo code that is available on the platform. Using Uber Eats you can order food on the go while taking an Uber ride. The discounts can be applied when you are on the checkout page and have chosen a dish from your favorite restaurant. Uber Eats has partnered with thousands of restaurants in over 18 Indian cities to bring you tasty food. Apart from its presence in major cities like Delhi, Chennai, Kolkata, Hyderabad, Ahmedabad, Gurgaon and Lucknow, Uber Eats has also started its service in cities like Guwahati, Thrissur, and Thiruvananthapuram. Now, you can order healthy food, finger-licking snacks and mouthwatering desserts with awesome promotional codes from Uber Eats. Hurry up and order now!